John Brumby replaced Steve Bracks as the Premier of Victoria in 2007. In 1995 John Brumby was the Opposition Leader of the state Labor Party when the Victorian Liberal Party was in power under Jeff Kennett. At that time Mr Brumby was big on promises to protect Victoria's old-growth forest. However, since the Labor party gained office in 1999, its record on forest conservation has been abysmal. 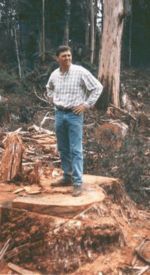 In 2002 the then Premier Steve Brack allowed the logging of the iconic Goolengook rainforest in East Gippsland, an operation that cost the government 1.7 million dollars in policing efforts to prevent protesters interfering with logging. Prior to the 2006 Victorian state election Premier Bracks promised that should the government be re-elected it would immediately move to legislate the protection of the Goolengook valley and an additional 30,000 hectares of old-growth forest. Once re-elected the government ignored this promise and logging continues in Victoria's remaining small areas of old-growth forest, especially in East Gippsland, and in Melbourne's water catchments. This page was last modified 22:39, 2 December 2008.